SeeLovely, BeLovely, DeLovely. Bright and happy, cloaked in pastel, no one can miss this belly button ring. 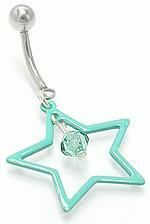 A teal-colored star dangles, holding a small teal jewel in the middle. You will feel lovely while wearing this piece. This belly button ring adds the pop in pop star!